Family and friends make emotional statements in court as Surrey teen's killer Gurjinder 'Gary' Dhaliwal is sentenced. 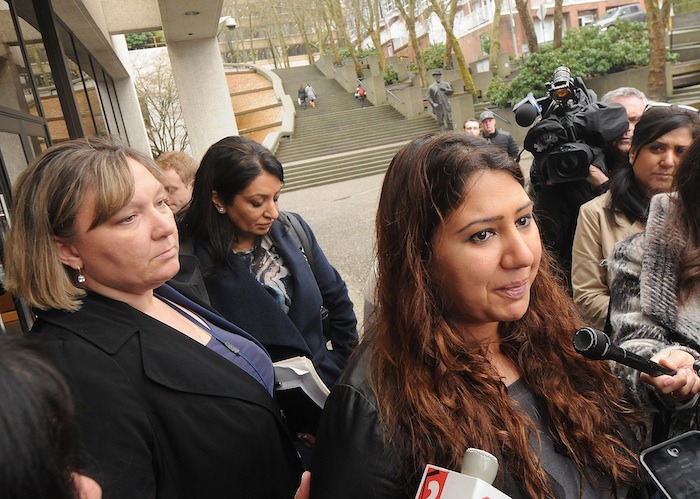 A courtroom in New Westminster was filled with the sounds of sobbing Monday morning as family and friends of Surrey murder victim Maple Batalia shared how her death more than four years ago has affected their lives. She spoke of her daughter’s happy life and how it was taken from her in a way not even an animal would be killed. She sobbed, saying she wished it was her and not her daughter who was murdered. “Why did you kill my daughter?” she shouted through tears. Sarbjit Batalia was the last of about a dozen people who spoke and described their immeasurable loss prior to the sentencing of 19-year-old Maple Batalia’s killer, ex-boyfriend Gurjinder (Gary) Dhaliwal. On Thursday (March 3), Dhaliwal pleaded guilty in B.C. Supreme Court in New Westminster to second-degree murder in the death of his girlfriend of four years. The court heard that he shot and stabbed Maple in a parkade outside the Surrey SFU campus on Sept. 28, 2011 in a fit of jealous rage about a month after their break-up. He said he still writes cards to Maple on her birthday – March 4 – knowing his “little girl” will never come back. “Your actions, Gary, have denied us a happy life,” Harkirat said. The victim’s sister, Rose Batalia, said Maple was an integral part of the family and an amazing sister, daughter and friend. “No one could love us as much as she did,” said Rose. She said Maple not being able to attend her wedding was only one of the many dreams the sisters had that will go unfulfilled. She then addressed Dhaliwal directly. “Gary, you may have taken her life, but you can not take away her legacy,” Rose said. Several other victim impact statements were read by friends and relatives, who said they thought they knew Gary and never would have imagined him killing Maple. They spoke of Maple’s love of life and learning, as well as her compassion for others. “Her death was like stomping on a flower right before it blooms,” said one friend. Second-degree murder carries an automatic life sentence. Justice Terence Schultes set parole ineligibility at 21 years, meaning that will be soonest Dhaliwal will be able to apply for any type of release from prison. The judge acknowledged 21 years – which was recommended by both the Crown and defence – exceeds the normal range for such offences, noting such a length is generally reserved for multiple murderers. During last week’s guilty plea, Crown and defence lawyers presented an agreed statement of facts. In it, they detailed the weeks before Batalia’s murder, when Dhaliwal became obsessive. The couple had broken up in August 2011 due to Dhaliwal’s infidelity, but he did not want to end the relationship and proceeded to call and text Batalia thousands of times from different phones in the weeks that followed. Two weeks before the murder, Dhaliwal confronted men he saw with Batalia at a nightclub and sent her more than 300 texts that night alone. He confronted Batalia again on Sept. 24 when she was having coffee with a male friend. Dhaliwal tried to convince her to reconcile but the meeting ended with him pushing her to the ground. He was arrested later that day and ordered to stay away from her. On Sept. 26, armed with a knife and a gun he obtained to confront Batalia’s male friend, he went to the SFU Surrey campus in a rented white Dodge Charger. His friend Gursimar Bedi, who is also implicated in the case, went in and saw Batalia, but not the friend, so they left. Late on Sept. 27, the two men again drove to SFU. Dhaliwal parked and Bedi again went in and this time, saw both Batalia and her male friend. Dhaliwal, the court heard, became enraged when he saw the two hug and sat in wait in the parking lot until Maple emerged. He fired five shots, three of them striking Batalia in the torso and arm. He then slashed her on the top and back of her head. Batalia was alive when police arrived, but succumbed to her injuries in hospital in the early morning hours of Sept. 28. While the knife was found at the scene, the gun was not recovered, said Crown prosecutor Wendy Stephen. Outside court, she said though the case against Dhaliwal was circumstantial, she credited the thorough police investigation. Stephen said police tracked down the suspect vehicle within two days of the murder and discovered a shell casing under the hood, which matched the shell casing at the scene at SFU Surrey. Batalia’s blood was later found on the car’s headlight control and driver’s side visor. During sentencing Monday, Stephen said the fact the murder took place in the context of an intimate domestic relationship was one of several aggravating factors. Dhaliwal issued a short apology in court, but it was inaudible in the gallery. His sentence also includes a lifetime weapons ban and submission of a DNA sample. The trial for Bedi, charged with manslaughter with a firearm and being an accessory after the fact in Batalia’s murder, was scheduled to begin Monday afternoon, but was put off until Tuesday.